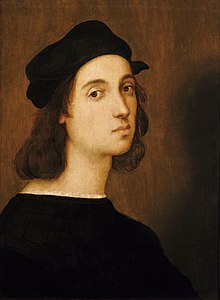 Raphael was born in the small but artistically significant central Italian city of Urbino in the Marche region, where his father Giovanni Santi was court painter to the Duke. 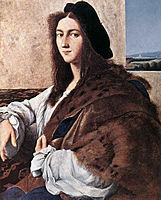 The reputation of the court had been established by Federico III da Montefeltro, a highly successful condottiere who had been created Duke of Urbino by the Pope – Urbino formed part of the Papal States – and who died the year before Raphael was born. 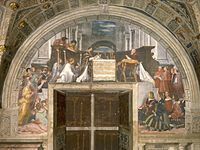 The emphasis of Federico's court was rather more literary than artistic, but Giovanni Santi was a poet of sorts as well as a painter, and had written a rhymed chronicle of the life of Federico, and both wrote the texts and produced the decor for masque-like court entertainments. 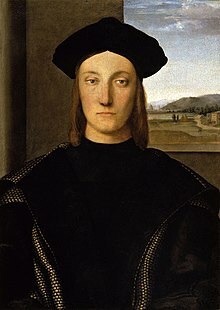 His poem to Federico shows him as keen to show awareness of the most advanced North Italian painters, and Early Netherlandish artists as well. 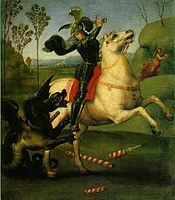 In the very small court of Urbino he was probably more integrated into the central circle of the ruling family than most court painters. 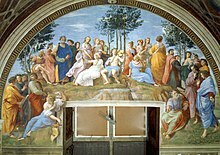 The Miraculous Draught of Fishes, 1515, one of the seven remaining Raphael Cartoons for tapestries for the Sistine Chapel. 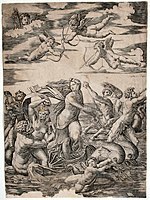 Triumph of Galatea, 1512, his only major mythology, for Chigi's villa. 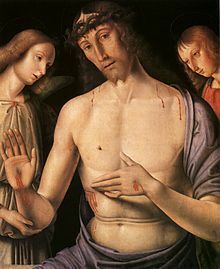 Raphael's premature death on Good Friday (April 6, 1520), which was possibly his 37th birthday, was due to unclear causes, with several possibilities raised by historians. 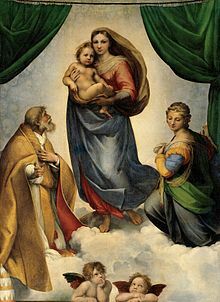 Vasari also says that Raphael had also been born on a Good Friday, which in 1483 fell on March 28. 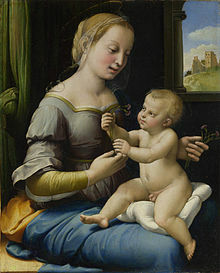 ^ Ashmolean Museum "Image". z.about.com. 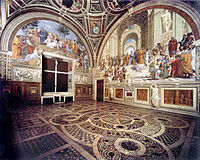 ^ Various other historians provide different theories: Bernardino Ramazzini (1700), in his De morbis artificum, noted that painters at the time generally led “sedentary lives and melancholic disposition” and often worked “with mercury- and lead-based materials.” Bufarale (1915) “diagnosed pneumonia or a military fever” while Portigliotti suggested “pulmonary disease.” Joannides has stated that “Raphael died of over-work. 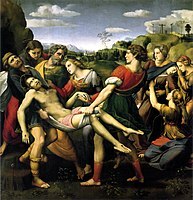 Note also that Raphael's age at death is also debated by some, with Michiel asserting that Raphael died at thirty-four, while Pandolfo Pico and Girolamo Lippomano arguing that Raphael died at thirty-three. 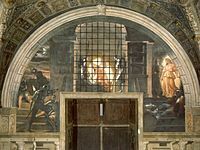 For all see: Shearman:573. 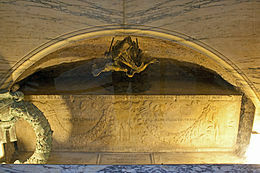 ^ Whereas Michiel said he died on his birthday. 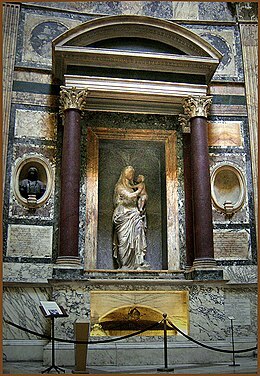 Art historian John Shearman addressed this apparent discrepancy: "The time of death can be calculated from the convention of counting from sundown, which Michaelis puts at 6.36 on Friday 6 April, plus half-an-hour to Ave Maria, plus three hours, that is, soon after 10.00 pm. 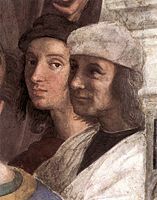 The coincidence noted between the birth-date and death-date is usually thought in this case (since it refers to the Friday and Saturday in Holy Week, the movable feast rather than the day of the month) to fortify the argument that Raphael was also born on Good Friday, i.e., 28 March 1483. 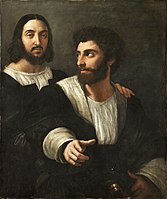 But there is a notable ambiguity in Michiel’s note, not often noticed: Morse … Venerdi Santo venendo il Sabato, giorno della sua Nativita, may also be taken to mean that his birthday was on Saturday, and in that case the awareness could as well be the date, thus producing a birth-date of 7 April 1483." 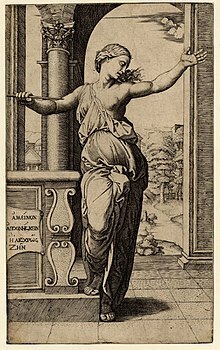 Shearman:573.